The video playlist includes clips of both the original version and the sequel IK+ for most popular computer formats. What I remember being most impressed by in this martial arts game was actually the scenery. There were eight fantastic backdrops which included (in chronological order) Mount Fuji in Japan, Sydney Harbour Bridge in Australia, the Statue of Liberty in the USA, the Forbidden City in China, Christ the Redeemer in Brazil, the Houses of Parliament at Westminster in London, the Parthenon in Greece and the Pyramids of Egypt. 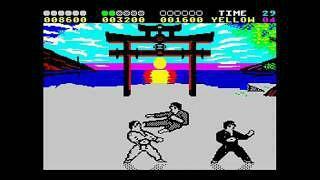 International Karate was originally released in 1985 for the ZX Spectrum and this version was ported to the Amstrad CPC machines. However, a more superior version was developed and published by Arthur Maclean for System 3 in 1986 for the Atari 8 bits and the Commodore 64. Versions were also ported to the Commodore 16, MS-Dos, MSX and Apple II computers. The Arthur Maclean version also features oriental-themed music by the legendary 80s composer Rob Hubbard. Andromeda Software released a version for the Atari ST in 1986. In the U.S. the game was released as World Karate Championship by Epyx and this version got them into trouble. 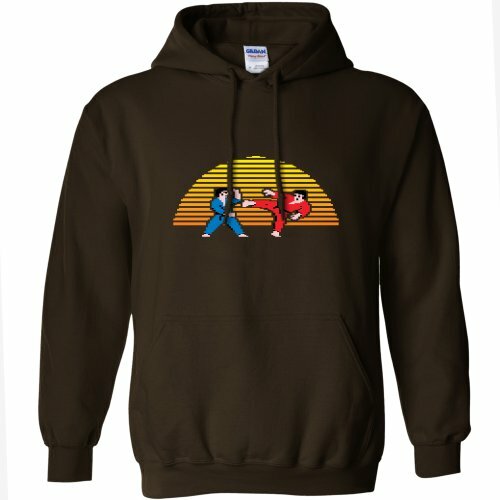 The publsher of the 1984 game Karate Champ actually sued Epyx for copyright and trademark infringement as it used the same coloured fighters and points system - all copies of the game had to be recalled from both customers and distributors. The gameplay itself involved a one-on-one fight with either the computer or another player, and I remember being pretty impressed with the smoothness of the fighters animations and also the responsiveness of the joystick. 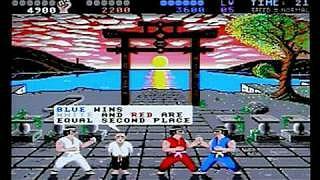 In single player mode, as you progressed through the game your opponents would become increasingly more skilled, starting with a white belt and ending with a black belt. 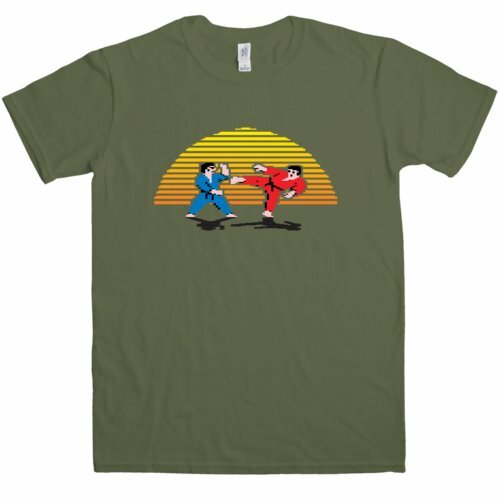 The high quality graphics and playability were a winning combination, and International Karate was certainly one of the best fighter games to come out of the 80s. A collage of screen grabs from International Karate including the title screen, ZX Spectrum Sydney Harbour backdrop, C64 Forbidden City in Bejing and C64 Mount Fuji on Honshu Island backdrop. A sequel was released by System 3 in 1987 for the 8-bit and 16-bit home computers and in 1988 a version was released in the U.S. for the C64 by Activision entitled Chop N' Drop. Disappointingly, the game only featured one backdrop, although the colours could be altered by the player. However, the Atari ST and Amiga versions were particularly good with fast, responsive gameplay and sampled sound effects. The music soundtrack was composed by Dave Lowe for the ST and Amiga versions which won "Best 16-bit Soundtrack of the Year" at the Golden Joystick Awards. Overall, IK+ was a pretty superior game to the original 8-bit version, despite the single background.